Jan Perry plays a theory game with some of her Blast Off With Piano! students. Ive been teaching piano for about twenty-eight yearstwenty-two of those years as a private lesson teacher and the past six years as a group piano teacher. As a private lesson teacher, Id drive to each students home to teach his/her piano lesson. But many of my students were at the same place in their piano knowledge and I found myself teaching identical lessons over and over each afternoon. I was bored and knew there must be a better way to teach these youngsters! I was also concerned about my middle school students. Just when they were becoming good at their piano playing skills, most of them were quitting piano to join a group activity. Oddly enough, a good friend of mine (Doris Schneider, who is now living in Florida) felt the same exasperation in her teaching. And at that same point in time, we both received postcards from The Mayron Cole Piano Method stating a group piano teachers seminar was going to be held in Atlanta. Doris and I decided to attend. I was going to Atlanta with some pre-conceived ideas, though. I wrongly thought group piano meant putting a cluster of students in a piano lab with headphones while an instructor sat at a teachers console and taught them. A lot of teachers in my association held that outdated viewpoint of group piano teaching, and I was nervous about their opinions of me if I became a group piano teacher. I came home very excited about my new direction in piano teaching. My husband and I bought a house with a basement that I could use as my piano studio. 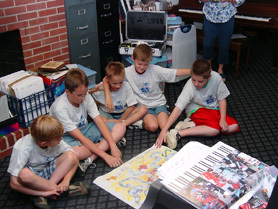 I then purchased Roland electronic pianos so I could teach six students at a time. But I was struggling to get acclimated as a group piano teacher, and my first year of teaching Mayrons piano method went slowly, I thought. I did everything Mayrons teacher manuals suggest! We played theory games and drilled on the notes and rhythms and played our music in ensemble. And I could see my new group students were thoroughly enjoying their piano classes  but I wanted them to go faster. But my frustration with their speed changed in the fall when most of the group students came back after not taking lessons in the summer. The students who were taught with The Mayron Cole Piano Method remembered their notes and rhythms and didnt require any remedial lessons to catch back up. That was a big surprise! 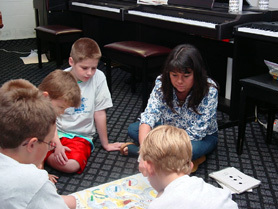 My group piano students had learned better than when I had privately taught! Six years later, I teach 135 students in four afternoons. Ive doubled my studio enrollment with group piano. Earning more money is icing on the cake because it was not the main reason I changed to group teaching. But its a great benefit. And I teach more boy students than girls! I think group lessons have kept the boys coming to piano class, and I suspect that the eye/hand coordination has helped them in sports. For most kids, piano lessons are the lowest event on their activities totem polebut group piano has helped change that! One of the greatest benefits about teaching in groups is the ensemble playing the students get to do. I make sure that every piano class has at least one ensemble piece that they are always working on. Even my younger students play in ensembles. The ensemble playing shows what group piano teaching is all about  creating music with other people! I love to see the students faces when all the parts finally come together. My beginners this year are playing Mayron Coles Western Skies, Autumn Sounds, and Bullfrog Jamboree ensembles. These ensembles are great for beginners because the rhythm is the same in each piano part but the notes are different. And at my recitals, each student plays in an ensemble with his/her class and then plays a solo. Here are some suggestions that other teachers might enjoy: to add variety to beginner lessons, we learn easy ensembles four ways in four lessons: (1) every student learns each part of the elementary ensemble; (2) students play with different sounds on their keyboards; (3) students play with the teachers accompaniment added; (4) students play in ensemble with the accompaniment disk. It takes four lessons to become good enough on the ensemble to get to play it with the accompaniment disk  and that is the reward! I tell parents that group piano is a wonderful recreation for ADD (attention deficit disorder) children. They learn to focus on what they are doing with a different outside noise each lesson. Piano goes so far beyond just playing the keys, doesnt it? One of my favorite programs from The Mayron Cole Piano Method is the summer program, Blast Off With Piano!© There is a part of me that wants to be just a Blast Off teacher and then send the kids on to other teachers. I teach Blast Off in four days instead of five because so many parents want to go out of town on Fridays in the summer. Of course, I dont complete the entire Blast Off booklet, but if the students continue with piano in the fall, we complete it before beginning Level 1-A. I like to issue T-shirts to my Blast Off students. One of their activities during the summer session is to paint on their T-shirts some of the rhythms that they have learned. We use glow-in-the-dark markers. At their last lesson, which is the recital lesson, the kids wear their T-shirts and we turn the lights down low to see all the glowing. The kids love it! And the parents are really impressed with what the kids have learned in just four days. Its also a sort of audition for the kids since I can easily tell who really wants to take piano and who can sit through a 45-minute piano class lesson. And the students have not wasted their time even if they dont take piano later. Blast Off teaches rhythm and keyboard, and that can be used in most school music classes. I teach Blast Off With Piano almost all summer long. When interested parents call for summer program information, I send them a calendar and a Blast Off brochure. The brochure states that they may have a special class with their friends if they/the friends sign-up early. The parents circle three different weeks that they can attend and mark a morning or afternoon preference. As soon as three students sign-up for the same week/time, that becomes a scheduled class! Anyone who calls later is told of the already scheduled classes. For me, this system of scheduling summer Blast Off classes works! Parents may also go to my website www.janspianostudio.com and print a registration form which can be mailed to me. I already have fifteen kids signed up for Blast Off this summer and fourteen of them are boys! Im at a point now where I dont have to advertise for more students. Ive never gone down in student enrollment since I started group piano teaching. But I do try to find room for ten to fifteen new students a year, and I do that by combining classes. I usually have about four classes that are at the same level so if a student misses a lesson he/she may attend one of the other classes. I dont teach make-up lessons.